The Net Impact session on “Beyond Microfinance: Investing in the Developing World” was timely in that it highlighted the certification program for the Grameen Foundation’s Progress out of Poverty Index (PPI). I thought I would take this opportunity to highlight some of the potential strengths and possible shortcomings of the 5-month-old certification process. What is the Progress out of Poverty Index? The tool is adapted to each country by using their national household survey (or another equivalent survey) to find the indicators most highly correlated with poverty. These indicators are then narrowed down to a set of 10 (see diagram below) that will be used to quickly evaluate movement out of poverty within MFIs. How is the PPI value proposition different from other evaluation methods? Grameen Foundation promotes the PPI approach as a cost-effective, easy-to-use method for evaluating poverty. The tool requires measurement of only ten items, all of which are observable upon visiting the borrowers’ households (i.e., type of flooring or roofing). Additionally, analysis of results may be done quickly by adding weighted values for each question, which total to a score of 100. 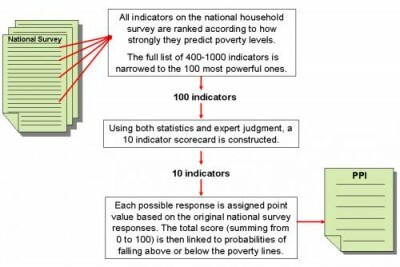 Individuals’ progress out of poverty is determined on a scale from 0 to 100. The measurement is conducted each year and any changes are compared over time. Outside of the features highlighted on the Grameen website, one potentially beneficial impact of the PPI approach is that it could, if used appropriately and in a widespread fashion, standardize the process for how movement out of poverty is measured and create a large sample population for comparison. This standardization would enable interested parties to compare results over time and across groups, regions, organizations etc. So what’s in store for microfinance in the next generation using the PPI approach? Grameen Foundation aims to help MFIs across the world stay true to their mission to alleviate poverty. Groups using the PPI platform can define their measures for success in a systematic way, respond quickly when said measures are not showing documented results and provide feedback to their investors. While these organizations’ aims generally do not differ much from the objectives of any evaluation or impact assessment platform, Grameen Foundation’s certification program – in conjunction with its PPI assessment – has the potential to raise the bar of evaluation for some groups that are not currently conducting yearly assessments and potentially standardize the process. Regardless of the impact, Grameen Foundation’s support for a certification process in measuring movement out of poverty provides one coordinated effort for measuring impact among a growing number of suggested approaches (GIIN, GIRRS, IRIS etc.). While the tool is easy to use, transferrable and certified, there are some questions left unanswered about this approach. For instance, in an effort to better serve those at the BoP, how can we be sure that we are portraying a realistic picture, both successes and failures, associated with a particular poverty alleviation method? One way to do this is to engage multiple models of assessment, viewing the movement out of poverty as a multifaceted change therefore needing a variety of quickly acquired outputs as well as robust outcomes. A helpful example to convey this point comes from the Grameen Foundation website. The PPI method “aims to measure changes in poverty through time. Thus, some powerful indicators (such as education of the female head/spouse) that are unlikely to change as poverty changes are omitted in favor of slightly less-powerful indicators (such as the number of radios) that are more likely to change.” I would argue this dichotomy is unnecessary, potentially harmful and something that appears to have staying power as we’ve been discussing for some time (See this article by Heather Esper). If we focus primarily on measures that can be counted, easily observed and quantified in a shorter period of time as our standard method for assessment, we will potentially skew our timeframe for change and also simplify perceptions of relative successes and failures. As the old adage goes, usually the things worth doing in life are also often the most seemingly difficult to do. In the case of assessment this might mean spending more time on detail, measuring a greater number of diverse impacts and, overall, investing more time in the process. The results of in-depth assessments of this nature are potentially the greatest (and most accurate) indication of how individuals are being served by a program. In this vein of thought, I propose that a better conversation to be having is how can we integrate both standardized methods for evaluating short-term changes related to poverty alleviation as well as powerful standardized long-term outcomes. And in doing so, how can we change our measurement model for social change to track and continually assess both short and long-term benchmarks? Additionally, what type of enabling environment needs to be in place to support multifaceted approaches to measure movement out of poverty?